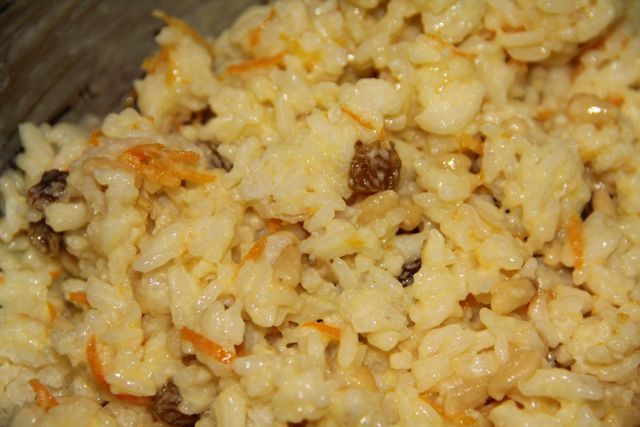 Here is a recipe that our family enjoyed during one of our Lenten Tea/Dinner's during Holy Week last year. It would also be perfect for Palm Sunday! 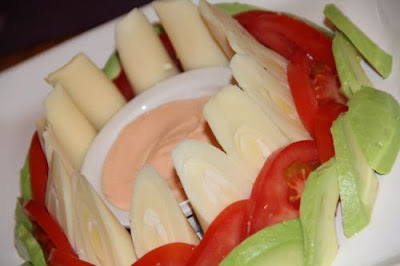 In a small bowl, whisk the mayonnaise, ketchup, white sugar, lemon juice, paprika and pepper together. Slice tomatoes and avocados to desired thickness and arrange around your serving plate. Sprinkle avocado with lemon juice to keep fresh. 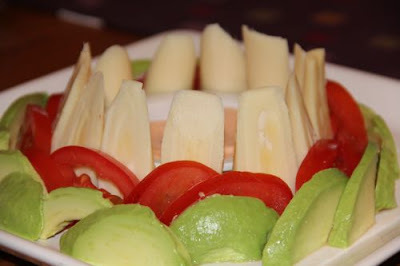 Chop hearts of palm diagonally and arrange on plate with tomatoes and avocados. Pour dressing into a small serving bowl (for dipping sauce) and drizzle with olive oil. 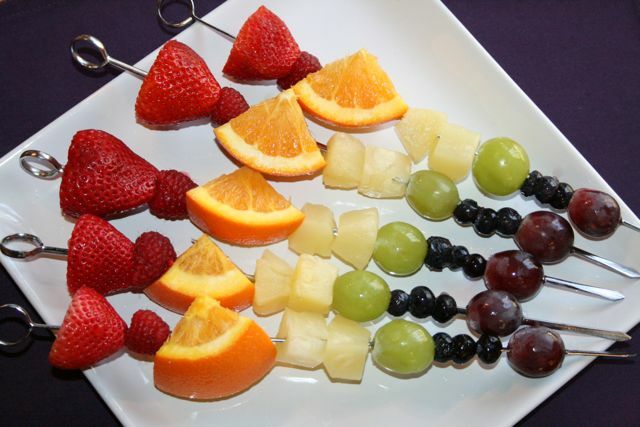 Garnish with sun dried tomaroes if desired, and serve! Note: You may make the dressing ahead of time, but I wouldn’t slice the vegetables until just before serving, to keep them fresh. Sautéed vegetables, onion and chili peppers served over hot rice. A splash of cumin and turmeric gives this dish a rich, warm aroma. Heat oil in a pot, add cumin seeds and cook for 2 minutes. Add green chilis, onion and turmeric and sauté for 2 minutes. Add chopped vegetables and sauté until slightly fried. 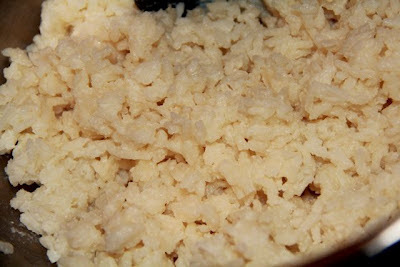 Add rice, salt, and water. Cook until rice and vegetables are cooked and water completely absorbed (about 20 minutes). Catholic Relief Services' mother and child health programs in India and around the world train health workers to care for families with young children. For more information please visit Operation Rice Bowl. 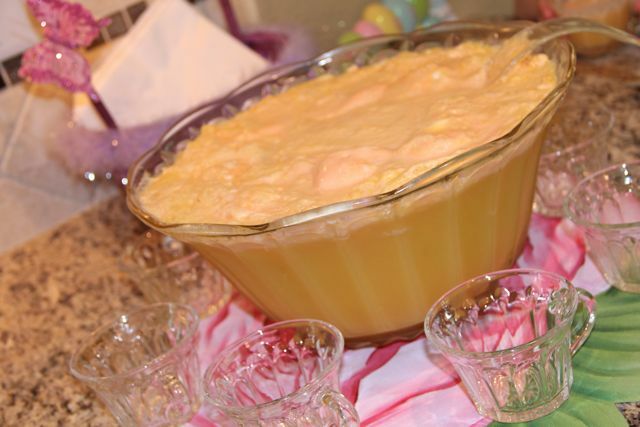 Speaking of punch recipes, I thought now would be a great time to share the "Golden Easter Punch" our family enjoyed last Easter Sunday, since Easter is coming up in just two weeks! Mix juices and vanilla in a large punchbowl. Add 7-up, stirring well. Add sherbet just before serving. This past January our family celebrated the Sacraments of First Confession and First Holy Communion for two of our daughters, immediately followed by our new baby boy's Baptism. 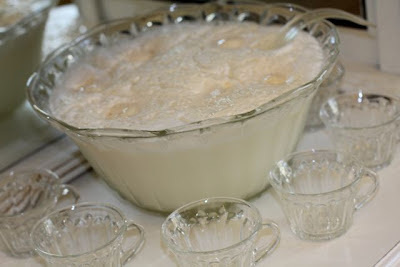 I wanted to make a white punch to serve along with the Baptism and First Communion Cakes at the reception, since white is a symbol for purity. 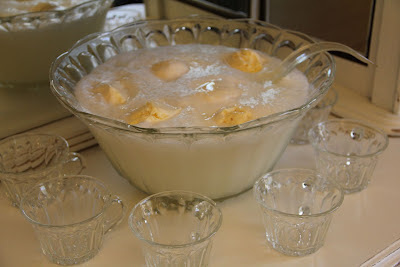 I ended up modifying a recipe for White Holiday Punch from Food.com, cutting back on the amount of ice cream. It was perfect! When you are ready to serve the punch, combine the milk mixture and lemon-lime drink (I used 7-up) in a punch bowl. 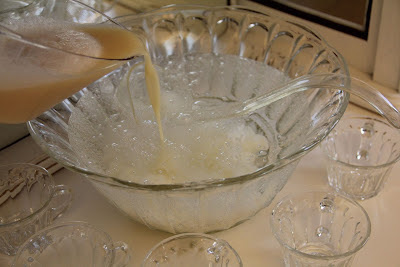 Add the scoops of ice cream, and stir to break up the ice cream, incorporating it into the punch. Note: This makes a lot of punch, enough to fill my little punch bowl about 6 times. It would have been easier to have a much larger bowl, but instead I just filled it with one liter of 7-up at a time, adding 1/6th of the milky mixture, and then finishing it with 1/3 of a carton of vanilla ice cream. The following recipes were submitted by the International Olive Council. For these recipes and more, visit www.addsomelife.org. Lent is long. For those who keep to a Lenten schedule, at this point in the ritual they’ve had about as many fish fries as they can muster. Childhood memories of the Friday Fish Fry are replaced with visions of something light and fresh. Luckily, the International Olive Council (IOC) has three scrumptious alternatives that offer flavor, freshness and an epicurean touch. These recipes feature olives and olives oil for a healthier twist on this Friday’s fish. Olive oil offers a naturally healthful way to incorporate fats into the diet—replacing olive oil in recipes for deep fried foods or foods sautéed in butter is an easy way to reduce the level of LDL or “bad” cholesterol while increasing the “good” HDL cholesterol in the diet. 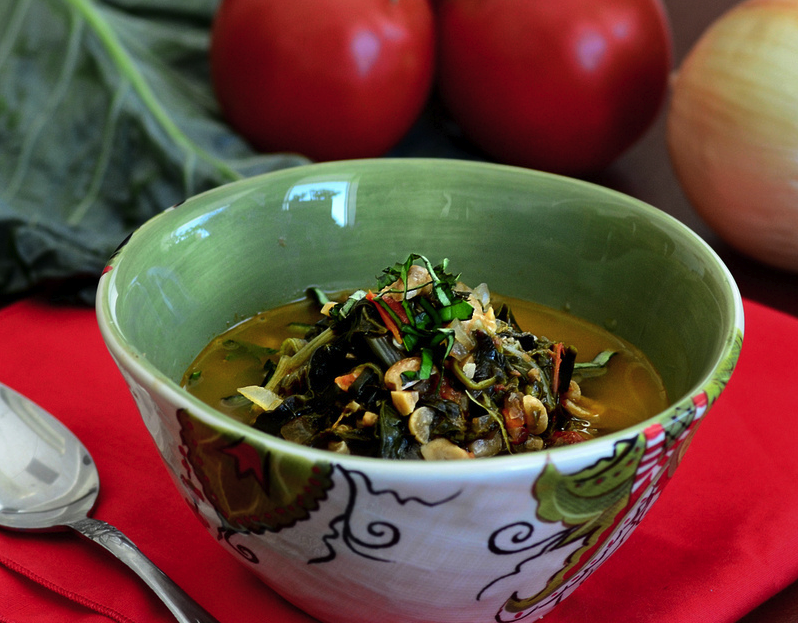 Infused with the Mediterranean flavors of olives, tomatoes and wilted kale. 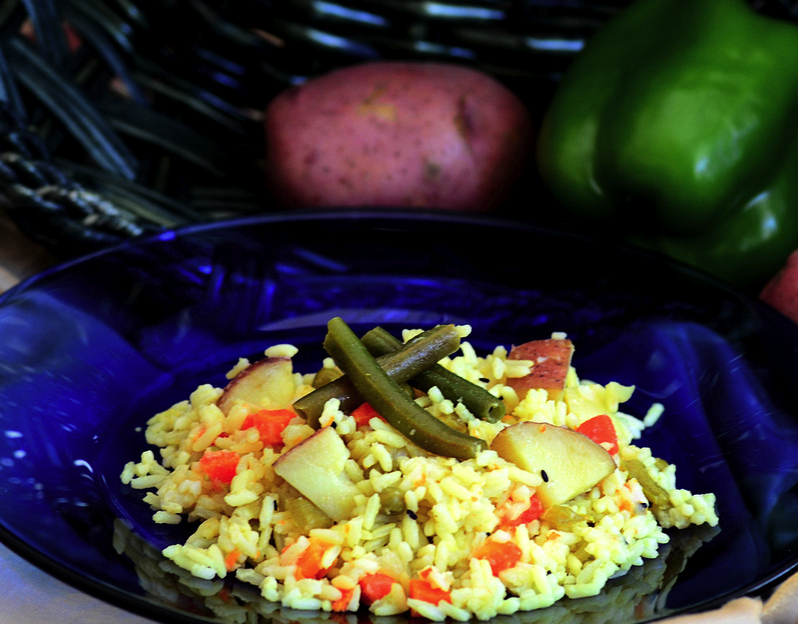 Pair with a side of lentils for a hearty yet wholesome dinner. Sprinkle fish evenly with dill, salt and pepper. Heat 2 tablespoons oil in large skillet over medium heat; add fillets. Cook 3 minutes per side to brown lightly. Remove fish to platter; set aside. In same skillet, heat 2 tablespoons oil over medium heat. Add onion and garlic; cook and stir 2 minutes. Add kale; cook and stir until kale begins to wilt, about 2 minutes. Place fillets in center of skillet. Arrange tomato slices around edge of skillet; sprinkle with olives. Drizzle fish with remaining 2 teaspoons olive oil. Cover and cook over medium heat 10 to 15 minutes or until kale is tender and fish flakes easily in center. The “I-must-have-my-fish-fry” crowd will love this dish. 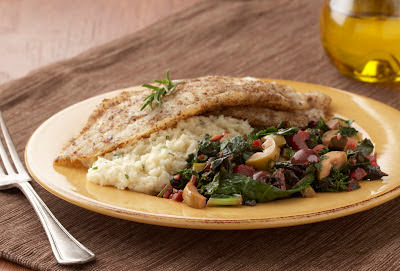 Quick and easy fillets pan-fried in heart-healthy olive oil are accompanied by a salad of late-winter’s best leafy vegetables and two-types of olives. Mix flax meal, flour and salt (if desired) in shallow dish or pie plate. Coat fillets evenly with mixture; pressing lightly to coat. Place on baking sheet or platter and refrigerate. Prepare remaining ingredients; set aside. In separate large skillet; heat 3 tablespoons olive oil over medium-high heat until very hot but not smoking. Add fillets; cover and cook 3 minutes. Turn fillets; cook uncovered 2 to 4 minutes or until fish flakes easily in center. Meanwhile, heat remaining 1 tablespoon olive oil in Dutch oven or large skillet over medium heat. Add garlic and rosemary; cook and stir 30 seconds until fragrant. Add chard and kale; toss to mix. Cook 3 minutes, stirring occasionally. Stir in olives and cook 3 to 4 minutes longer or until greens are wilted but not soft. Serve with fillets. Add pepper to taste. 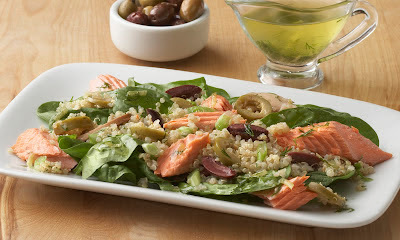 A healthful combination of quinoa and salmon, perked up with and olives for a salad that can also be eaten as a main course. Heat oven to 400◦F. Line small baking sheet with foil; lightly grease with olive oil. Meanwhile, bring water to boil in medium saucepan, salt lightly if desired. Stir in quinoa; return to boil. Reduce heat; cover and simmer 10 to 15 minutes or until tender and liquid is absorbed. Remove from heat; let stand 5 minutes. Meanwhile, place salmon skin-side-down on foil. Drizzle 2 teaspoons olive oil evenly over fillet; sprinkle lightly with pepper, if desired and top with dill sprigs. Bake 15 to 20 minutes or until fish flakes easily in thickest part. Remove from oven; cool slightly. In large bowl, blend remaining 3 tablespoons olive oil, lemon juice, remaining 2 tablespoons dill and lemon peel; whisk until blended. Add quinoa, mushrooms, olives and green onion; mix to coat. Layer spinach on serving platter or plates; top with quinoa. Break salmon into large chunks and arrange on quinoa. Hot rice casserole served in a thick, buttery peanut sauce. Collard greens and tomatoes add a garden-fresh flavor to this creamy dish. Bring water to a boil in medium pot and add peanuts, tomatoes, and onion. After a few minutes, add chopped greens. Stirring occasionally, continue cooking for about 15-20 minutes, or until peanuts are soft and mixture has become a thick buttery sauce. Serve hot over rice. 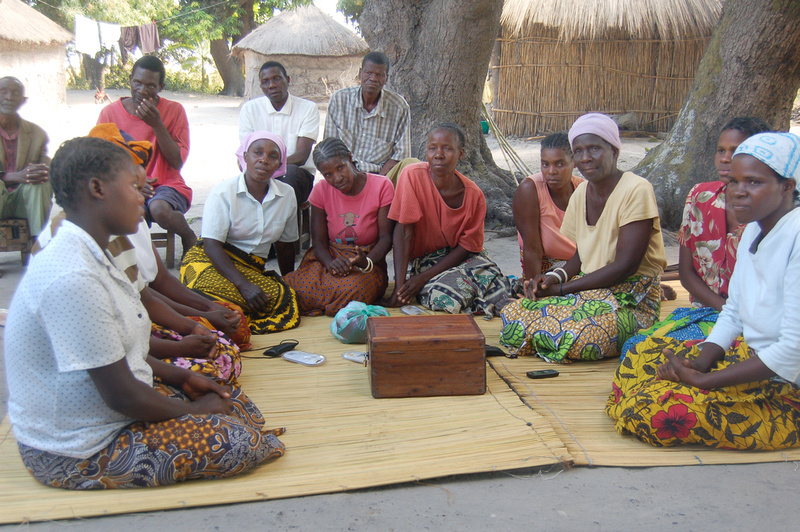 Catholic Relief Services' microfinance programs in Zambia help people earn more money to support their families and save for the future. In’utu Kokola and her husband are farmers living in Mongu, Zambia. Recently In’utu Kokola opened a shop in the market where she sells vegetables and corn meal from her farm. She didn’t believe this day would ever come, but it did thanks to a Savings and Internal Lending Community (SILC) started with the help of Catholic Relief Services. In a SILC, the group saves money and makes small, interest bearing loans together. With her market stall, In’utu Kokola and her husband now have a reliable income to feed their family, buy medicine and pay school fees for their grandchildren. For more information please visit Operation Rice Bowl. 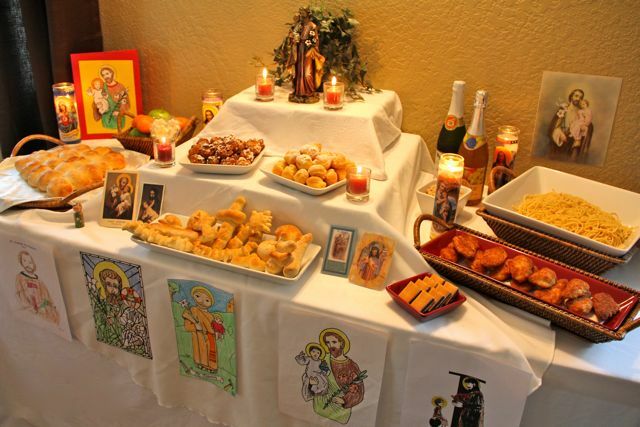 The 3rd Annual St. Joseph Altar Blog Fest is taking place over at The Virtual Saint Joseph Altar until the end of the month. Be sure to head on over to check out all the beautiful Altars that have been set up in honor of this beloved Saint, or to share pictures of your own. Here are the pictures of Our 2012 St. Joseph Altar. The winner of the beautiful embroidered Pysanky Basket Cover/Liner from Catholic Embroidery is #54. Congratulations Pamela! Thank you all for participating in the giveaway. There is still time to place an order for Easter! We are in the process of putting together our family St. Joseph's Altar in honor of today's feast. You can find ideas in the archives, beginning with Jennifer's great post on Foods for St. Joseph's Altar. 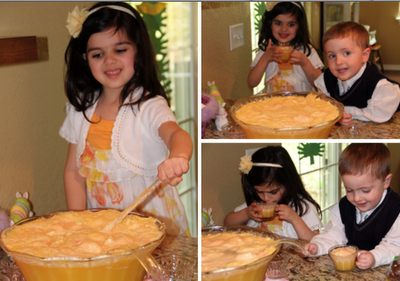 I offered each of my children a sample and they have all declared them a delicious success. They are all eagerly awaiting to eat the rest during our celebration this evening. Here is the recipe. 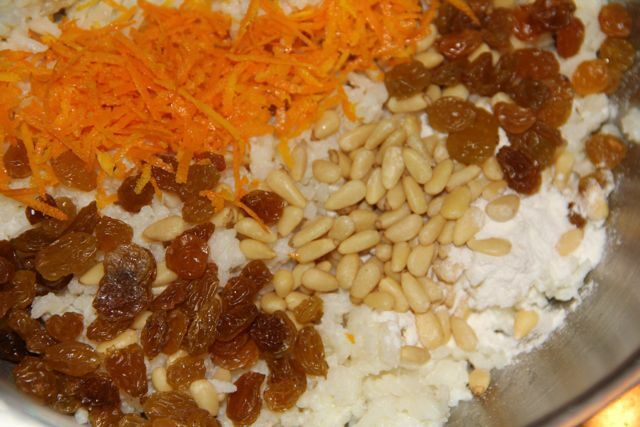 Mix the rice thoroughly with the eggs, flour, baking powder, brandy, orange rind, raisins, and pine nuts. 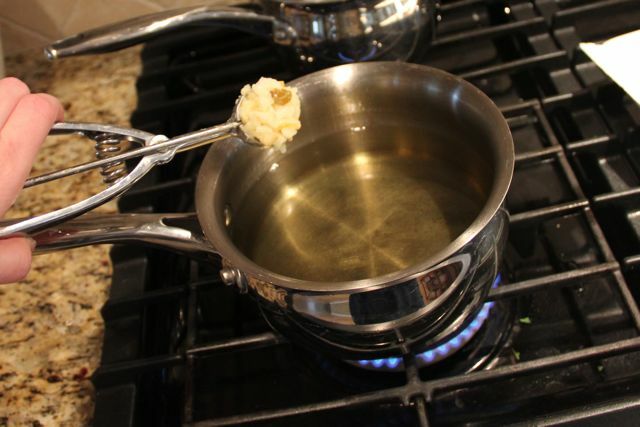 Heat the oil to 375˚ F. for deep-fat drying. Drop 1 tablespoon of the Frittelle mixture at a time into the oil until golden brown. You can cook a few at a time, keeping them separate. 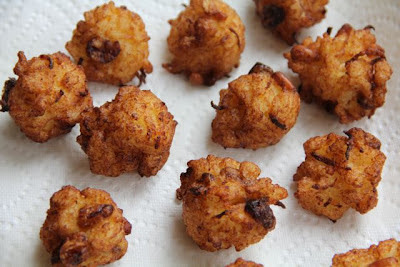 Drain the Frittelle on paper towels. 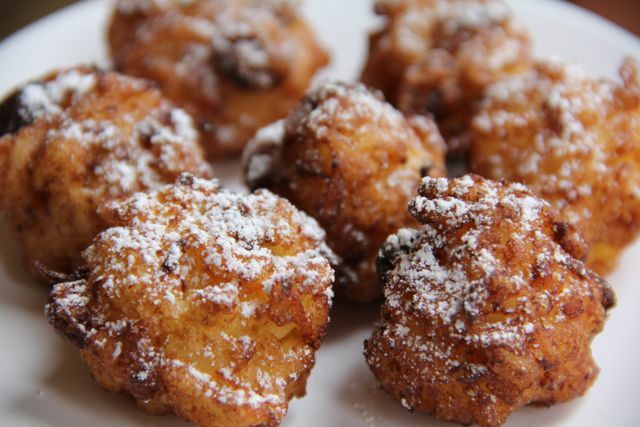 Sprinkle with confectioners' sugar and serve hot. Mix above well. Generously grease 2 loaf pans. Dust with a mixture of 1/4 cup sugar and 1/2 Tbsp cinnamon. Sprinkle remaining sugar mix on top. Remove immediately from pans and place in plastic baggies and refrigerate! I am about 1/8 Irish. My mom always argued with my dad, saying us kids were more Irish than German. My dad is 99% German though, so he wins that one. Us kids all had dark hair and blue eyes so mom always said we looked Irish. I thought the Irish were famous for having red hair? We make this bread for St Patrick's Day and for Christmas to give to all the neighbors! It's always a hit! Happy St. Patrick's Day and don't forget to wear your green! 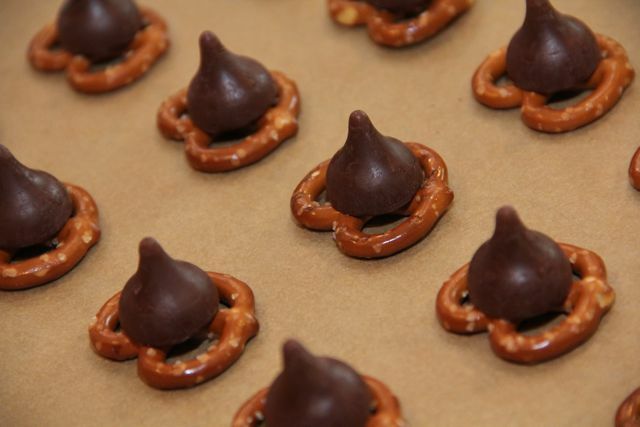 We have made many various combinations of Pretzels + Hershey Kisses or Rolos + M&M's or Pecans, but I just love the cute variation I recently ran across at Once Upon a Dream for "clover treasts." 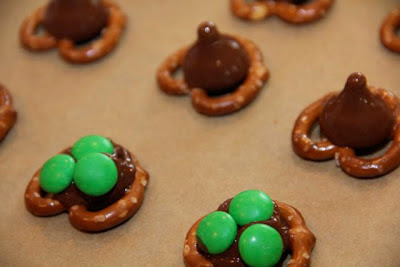 I made a couple slight modifications, making ours with some Irish Creme and Creme de Menthe Hershey Kisses (Yum!!!) 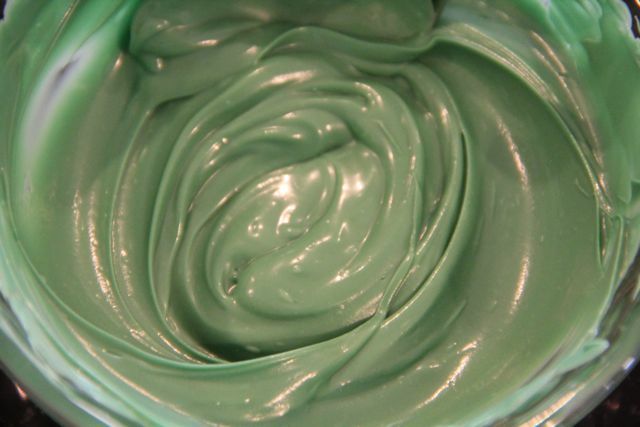 and green candy melts instead of the frosting. These will make a great little treat for the feast of St. Patrick! Cover a cookie sheet with waxed paper. 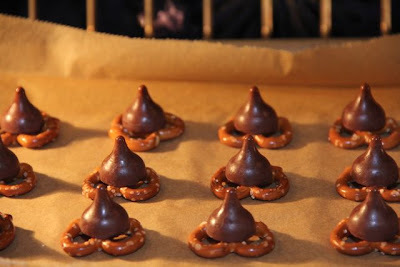 Cover with a single layer of pretzels and place a Hershey Kiss in the center of each pretzel. Place the cookie sheet in the oven at 200˚ for about 8 minutes, until the Hershey Kisses are soft, but not melted. 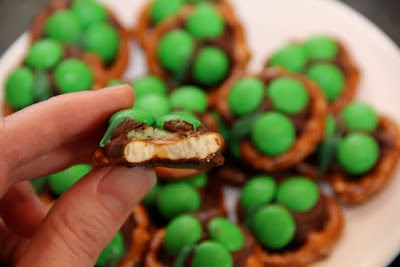 Remove the cookie sheet from the oven and immediately press 3 green M&M's on each Hershey Kiss, creating a Shamrock. 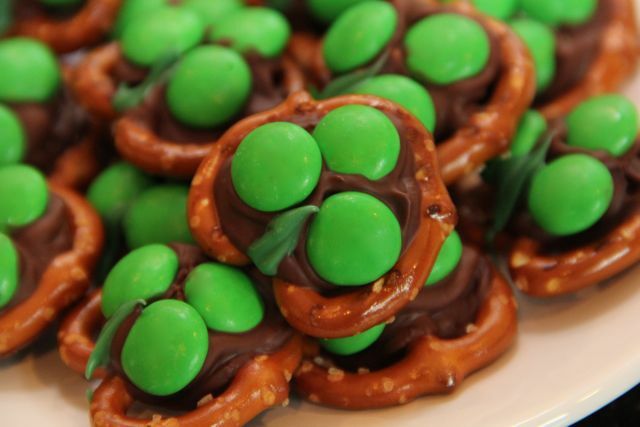 Note: I suggest looking for a bag of St. Patrick's Day M&M's or just purchase green M&M's from a candy store. The "big" bag of M&M's I originally purchased only came with enough to make 16 shamrocks. Nowhere near enough! Melt a few green candy melts (or use green frosting) and add a stem to each shamrock. 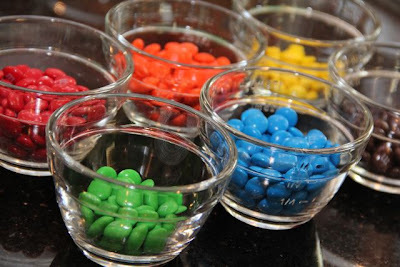 Put them in the fridge until the chocolate set back up. Then add a line of green frosting to make the stem. that stay with you all the year long. This past weekend, while one of our boys was attending a birthday party, my oldest daughter and I went out to lunch and then did a little (very little, since we had the baby with us) shopping. Since there happened to be a See's Candy store right next to the restaurant, I ran in to purchase some of the super cute Hollow Easter Eggs with White Chocolate Chicks that we love to include in our children's Easter baskets. 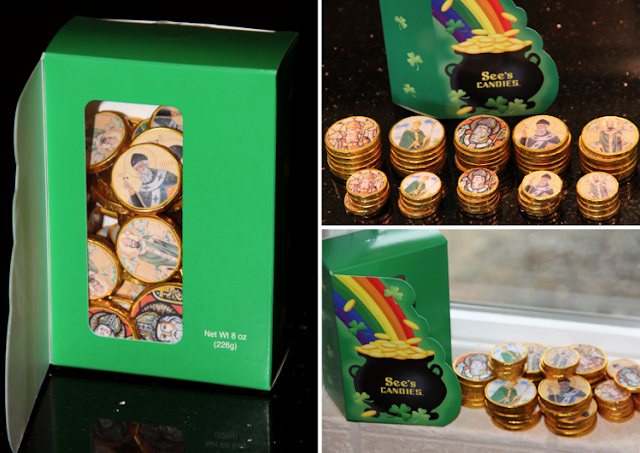 While I was there I also purchased a box of St. Patrick's Day Gold Coins. The box is rather expensive but comes with 50 Chocolate Coins - 30 large coins and 20 small - making each coin about .17 cents each! 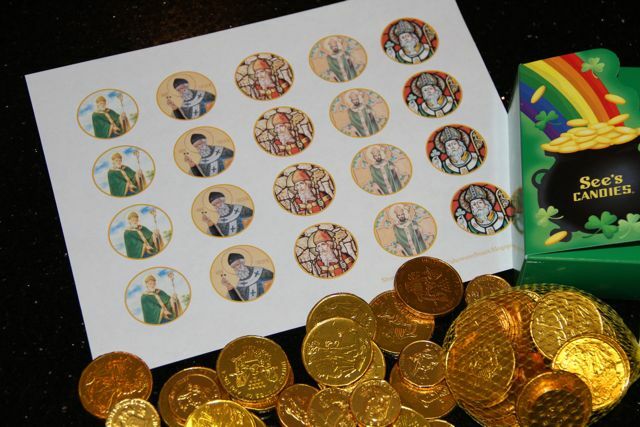 A couple years ago I shared our St. Nicholas Chocolate Coins with you all and, this year, thought it would be fun to make St. Patrick's Day Coins too! 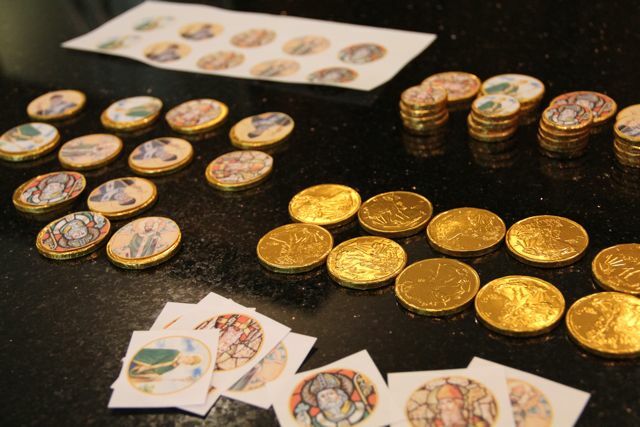 We thought these coins would make a fun addition to place on the tables during our coffee hour after Mass this Sunday honoring St. Patrick. 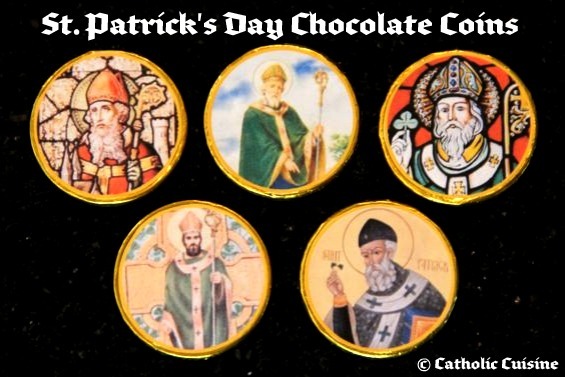 I cropped some old favorite images of St. Patrick to fit on the face of the large 1 1/2" Chocolate Coins (The See's coins are the same size as the ones that come in the smaller $1.00 bags that you can find at various grocery stores or online ), created a word document with all the images adding an optional border to the images, cut them all out, and then my children glued them to the front of the coins. 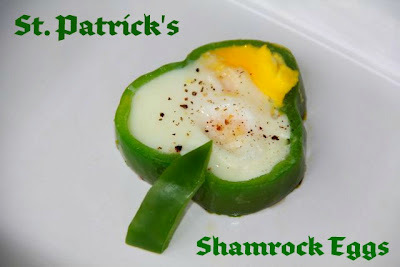 I thought I would share my documents with you all as an early St. Patrick's Day gift, in case any of you would like make some for your own St. Patrick's Day celebrations. 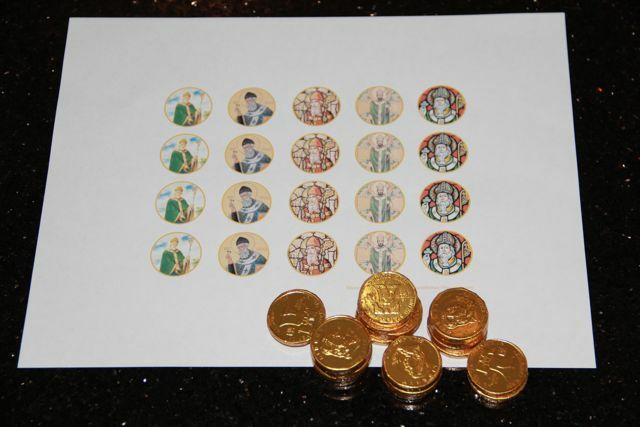 I printed out a second document at 70% to use for the smaller 1" coins. I saved it as a pdf, already in the reduced size, to share as well. there are three parts to the Holy Trinity. and the Holy Spirit together as One. 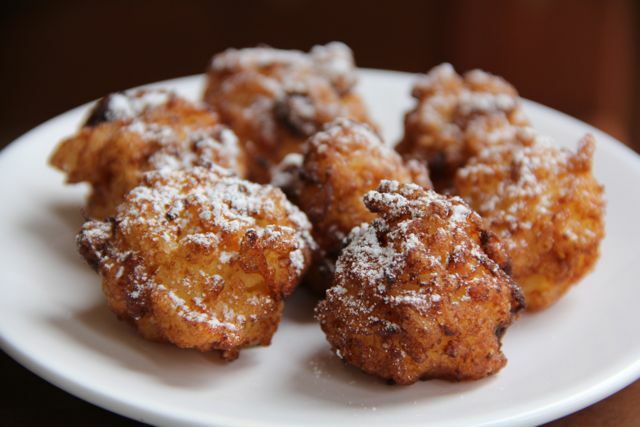 I recently agreed to help a friend provide treats for our Coffee Hour after Mass this coming Sunday. She choose the Sunday closest to March 17th so that we could incorporate St. Patrick's Day! 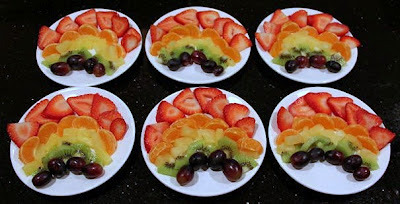 I will be making a couple of the treats and she is going to borrow a couple of my cookie cutters to make cookies, in addition to a big Rainbow Fruit platter and some Irish Cream coffee creamer. 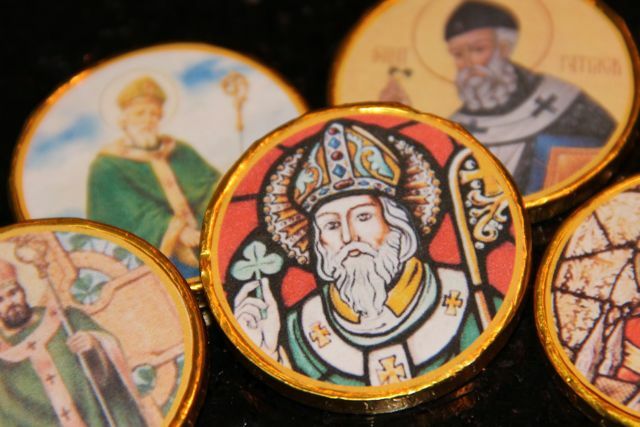 The dear owner from our local Catholic book store will be bringing St. Patrick and St. Joseph Holy Cards to set on the tables, in addition to a couple statues as well. It should be lots of fun! I have a few extra cupcakes in my freezer, so I made a sample cupcake to see how it would look. 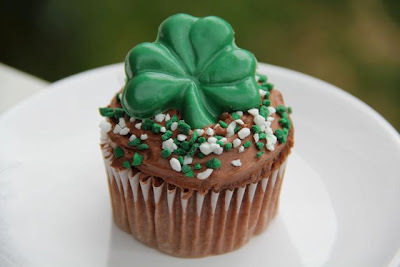 I've made Shamrock Mint Cupcakes in the past, but this time I decided to use my Shamrock Chocolate Mold to make candies to decorate the cupcakes. Didn't it turn out cute? 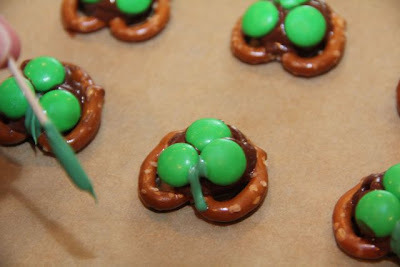 Fill each Shamrock with the melted Green Candy. 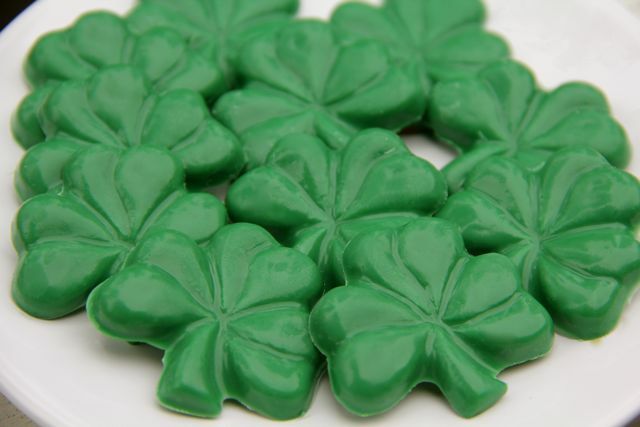 For the 2-inch mold, each shamrock required 3 candy melts. Tap against counter to remove any bubbles and then fill the molds completely, if needed. Spread Chocolate Frosting on top of each cupcake. 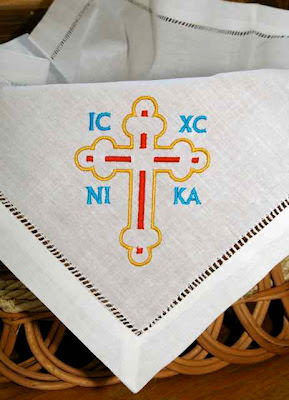 Catholic Embroidery has just launched a few more lovely items, just in time for Easter! I've added them to our list of Catholic Aprons available to order right here at Catholic Cuisine, or you can purchase one directly from the links below. Also, in honor of the upcoming feast of St. Joseph, Catholic Embroidery has generously offered to sponsor another giveaway! 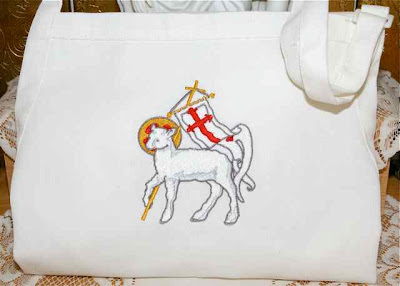 Click on over to our Apron Page and check out all the gorgeous kitchen products created by Catholic Embroidery and then leave a comment on this post before Midnight on Monday, March 19th, the feast of St. Joseph. Be sure to leave your email address, or have it linked in your profile, so that I am able to contact you. Note: One entry per person, please, and those that contribute here at Catholic Cuisine are welcome to enter as well! The winner will be announced on Tuesday, March 20th. A durable white twill apron, embroidered with the Triumphant Lamb of God design. This Biblical symbol of Christ represents the sacrificial offering of Christ’s redemption and his glorious triumph. Designed with two large pockets and an adjustable strap; measures 23" W by 30" L --- perfect for men and women alike. Extra long 39" ties and reinforced bar tacking construction ensure durability and practicality. Cotton & poly blend. This white hemstitched linen/cotton table runner measures 16” by 36” and is embroidered with a Triumphant Lamb of God design, a Biblical symbol representing the sacrificial offering of Christ’s redemption and His glorious triumph. A lovely addition to any table, desk, piano top, or sideboard. This 20” hemstitched linen/cotton basket liner is embroidered with our signature Pysanky Cross design. Inspired by the traditional Ukrainian Pysanky eggs, the budded cross is flanked on all sides with the Greek letters for Christ: IC XC and Greek verb for triumph: NIKA. 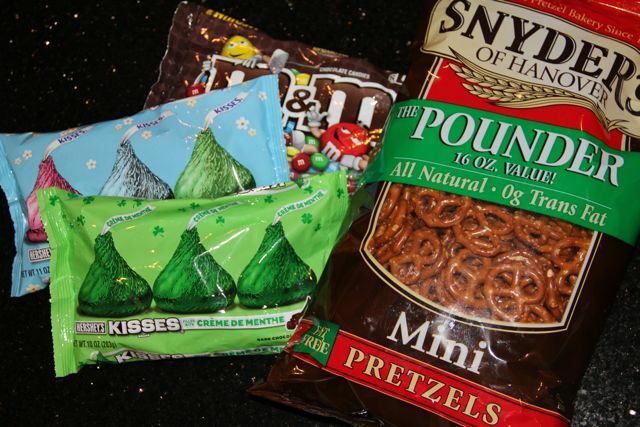 Hence, this basket liner provides a perfect Christian Easter basket, or meal any day of the year. The liner also functions as a cover, insulating food of all sorts, including baked items and breads. St. Joseph, Patron of Families, Pray for Us! 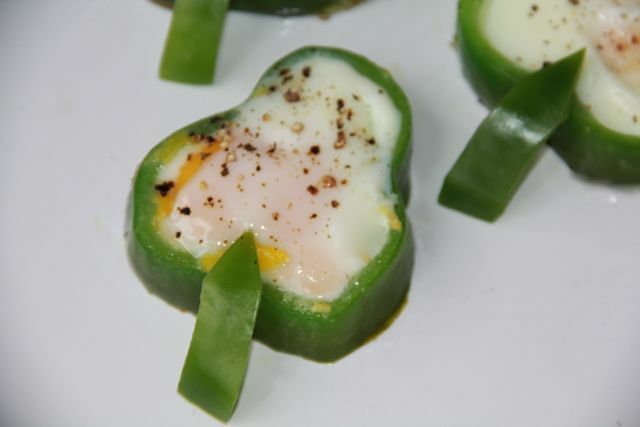 I'm thinking that these will make a great addition to the Cinnamon Shamrocks for our St. Patrick's Day brunch! I just need to get back to the store for a few more green peppers. Heat a non-stick skillet to medium low heat. Lightly spray skillet with cooking oil spray. 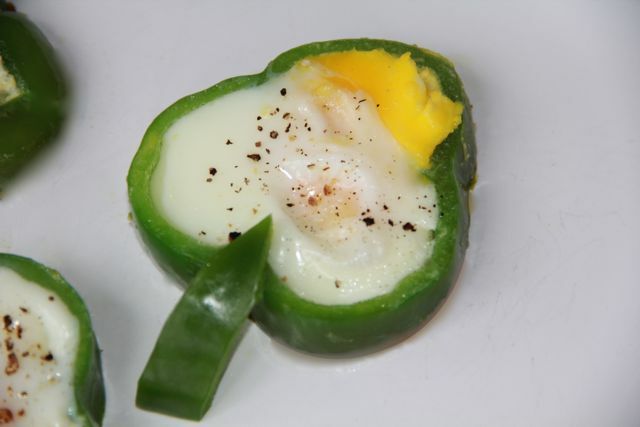 Cut bell pepper into 1/2 inch thick slices. (You should be able to get four slices from a larger pepper.) 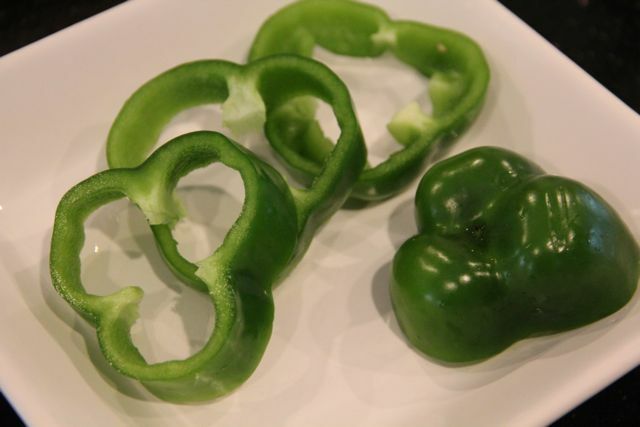 Slice some "stems" from the remaining pepper. Place pepper rings and stems in the skillet. 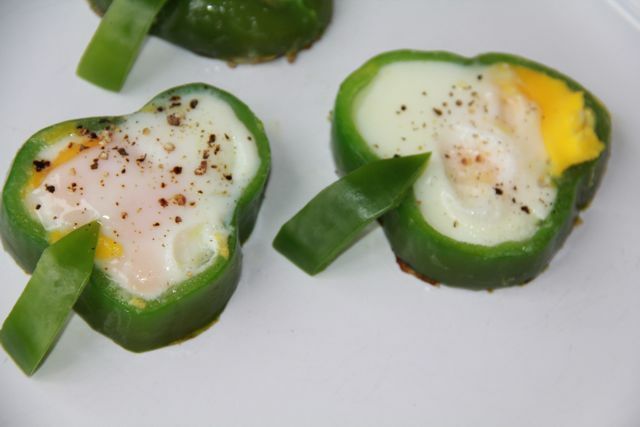 Crack one egg into each pepper ring. Cover and cook for a few minutes, until egg yolks are to desired firmness. 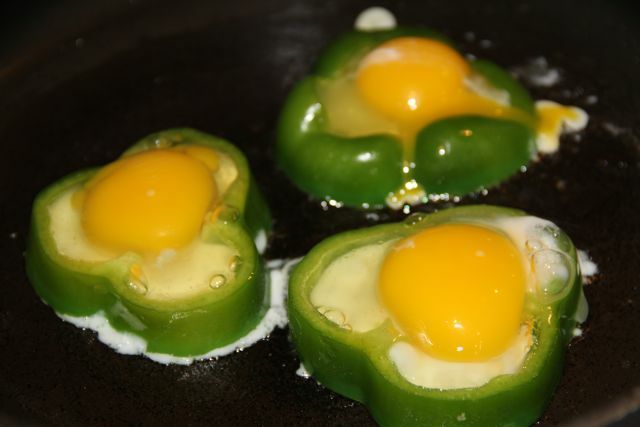 If you like your yolks firm, it helps to break the yolk right after cracking into pepper rings. Place one stem on each ring, completing your "shamrock." Season to taste. 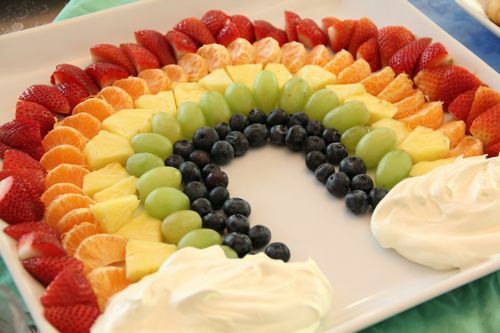 Serve with fresh fruit rainbows! (In the past we have made rainbow fruit skewers, a rainbow fruit platter, and mini rainbow fruit plates.) Enjoy!